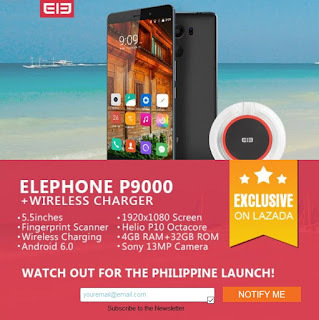 Yesterday, we received an email that Elephone, one of the most popular Chinese smartphone brands, is officially coming to the Philippines via Lazada. Previously, the local consumers are able to buy the Elephone devices through gray market and international online shops like GearBest. However, they are concerned about the price being expensive and most of the time, if not all the time, settle for the service warranty policy of the merchants. That is about to change, as this summer, Filipinos can get the Elephone Android phones at a more affordable price with warranty that includes parts. Initially, there will be three models that will be sold at Lazada, the Elephone P9000, P8000 and S1. The Elephone P9000 is the most premium among the three, it sports a 5.5-inch Full HD display powered by Helio P10 octa core processor clocked up to 2GHz each coupled with a massive 4GB of RAM and 32GB of internal storage. Meanwhile, the Elephpne P8000 boasts the same screen size and resolution, also an octa core, but features MT6753 chipset, has 3GB of RAM and a huge 4165 battery. On the other hand, the Elephone S1 is the entry-level offering and like the other two models, also has fingerprint sensor.